This INHBA protein is labelled with His tag. 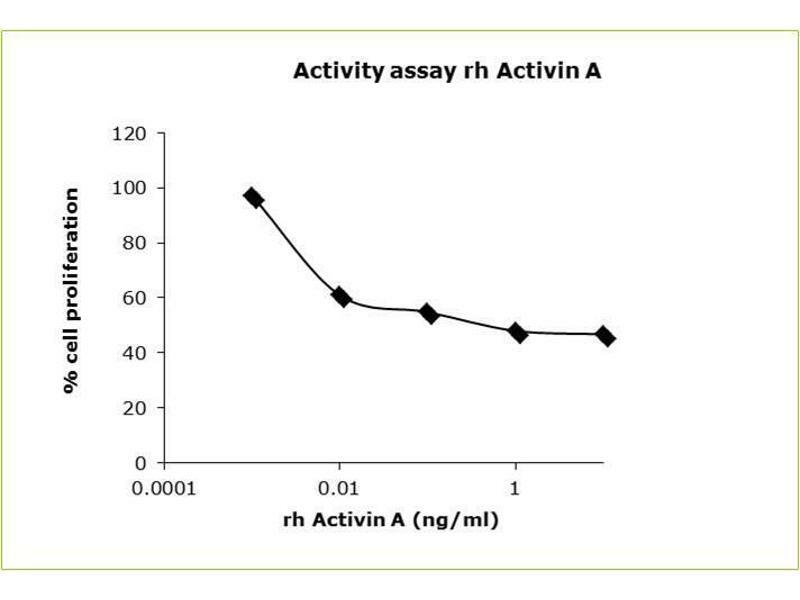 SDS-PAGE analysis of recombinant Activin A. Samples were loaded in 15 % SDS-polyacrylamide gel and stained with Coomassie blue. Lane MWM: Molecular weight marker (kDa), Lane 1: contains 200 ng of recombinant Activin A. Western Blot analysis of recombinant Activin A. Lane MWM: Molecular weight marker (kDa). Lane 1: 200 ng of Activin A.
Specificity Serological Identification: The protein was electrophoresed under reducing condition on a 15 % SDS-polyacrylamide gel, transferred by electroblotting to a NC membrane and visualized by immune-detection with specific antibody Activin A.
Characteristics Serological Identification: The protein was electrophoresed under reducing condition on a 15 % SDS-polyacrylamide gel, transferred by electroblotting to a NC membrane and visualized by immune-detection with specific antibody Activin A. Extinction coefficient: E 0.1 % (1g/L) = 1.27 (A 280 nm). This product contains no animal-derived components or impurities. Produced by transient expression of Activin A in non-transgenic plants. Purification Recombinant human Activin A contains a 6-His-tag at the N-terminal end and is purified by sequential chromatography (FPLC). Purity > 97 % by SDS polyacrylamide gel electrophoresis and the gel was stained with Coomassie blue. Activins are homodimers or heterodimers of the various beta subunit isoforms, belonging to the TGF-beta family. Mature Activin A has two 116 amino acids residues betaA subunits (betaA-betaA). Activin exhibits a wide range of biological activities, including mesoderm induction, neural cell differentiation, bone remodelling, haematopoiesis, and reproductive physiology. Activins plays a key role in the production and regulation of hormones such as FSH, LH, GnRH and ACTH. Cells known to express Activin A include fibroblasts, endothelial cells, hepatocytes, vascular smooth muscle cells, macrophages, keratinocytes, osteoclasts, bone marrow monocytes, prostatic epithelium, neurons, chondrocytes, osteoblasts, Leydig cells, Sertoli cells, and ovarian granulosa cells. As with other members of the super-family, Activins interact with two types of cell surface trans-membrane receptors (Types I and II) which have intrinsic serine/threonine kinase activities in their cytoplasmic domains, Activin type 1 receptors, ACVR1, ACVR1B, ACVR1C and Activin type 2 receptors, ACVR2A, ACVR2B. The biological activity of Activin A can be neutralized by inhibins and by the diffusible TGF-B antagonist, Follistatin. 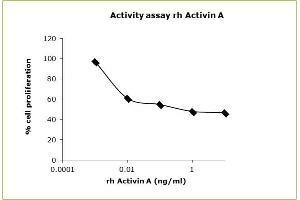 Biological Activity: The biological activity of Activin A is measured by its ability to inhibit mouse plasmacytoma cell line (MPC-11) cells proliferation ([3H]thymidine incorporation). ED50 ≤ 5 ng/ml. Human recombinant protein expressed in Nicotiana benthamiana. Recombinant human Activin A contains a 6-His-tag at the N-terminal end, is produced by transient expression in non-transgenic plants and is purified by sequential chromatography (FPLC). This product contains no animal-derived components or impurities. Animal free product. Reconstitution Lyophilized protein should be reconstituted in water to a concentration of 50 ng/µL. Due to the protein nature, dimmers and multimers may be observed. Upon reconstitution, It can be stored in working aliquots at -20 °C for future use. Buffer Tris HCl 0.05 M buffer at pH 7.4.